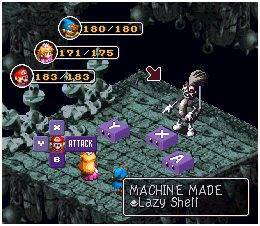 Super Mario RPG: Legend of the Seven Stars is a role playing game that was only released in Japan and North America. Your mission is to overthrow the Smithy Gang by reclaiming the seven Star Pieces so that wishes can once again be granted. You control 3 of 5 characters (Mario, Mallow, Geno, Bowser and Princess Toadstool) in turn-based battles and you can either use normal attacks, special attacks (requires flower points), items (e.g. to increase health or restore a downed team member), or defend / run away (to lessen damage). A timed hit mechanic is also included whereby pressing a button at the right moment will either increase your attack or decrease the damage you take from enemies. In a nice twist, the game throws away the rule book immediately by placing you into battle with Bowser! A lot of the enjoyment comes from learning enemy attack patterns and timing your attacks / blocks; it's a neat element that adds plenty of skill to the action. The world is a joy to explore with diverse locales, and I like how enemies are visible, allowing you to choose whether or not to attack rather than engaging in random battles. The game also does a great job of signposting and making sure that you're not wandering around aimlessly. It's a very lengthy experience too with tons of content, lots of interesting mini-games, as well as an abundance of secret items. The writing has a terrific sense of humour (with many hilarious in-jokes that give it a unique personality) and there's also an intriguing story that keeps you emotionally invested. There are a few clunky moments though such as the 3D Maze that you have to navigate blindly, and the platforming sections where the isometric viewpoint makes spatial distance hard to judge. Super Mario RPG: Legend of the Seven Stars is extremely ambitious and it successfully executes pretty much every part of its gameplay, presentation and story arch. The gigantic amount of content will make you want to revisit its charming world often, and its uncomplicated mechanics make it an ideal entry point to newcomers of the genre. Random trivia: The game was included on the Super Nintendo Classic console that was released in 2017.